With mixed emotions, DPOP announces the retirement of Committeewoman Jerry Delaney, and the appointment of Eileen Lynch as committeewoman of the Democratic Party of Oak Park. For 10 years, Jerry has served as the inspiration and the conscience of DPOP. Jerry has promised she is not leaving us, just stepping back a bit, and she will remain an active member of the DPOP family. In honor of her decade of service, Committeeman Don Harmon has designated Jerry as Committeewoman Emeritus. Many thanks, Jerry, for your dedicated and passionate leadership! And thanks, Eileen, for stepping up to fill some very big shoes! 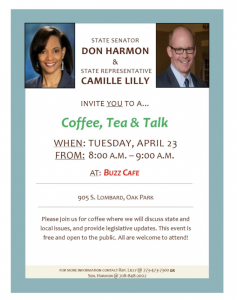 It's that time of year again- the Oak Park Farmers' Market will be starting soon. DPOP's table at the Oak Park Farmers' Market is one of our most important means of public outreach. 2019 is such an important year. We need big changes in 2020 and with your help, we can make that happen. 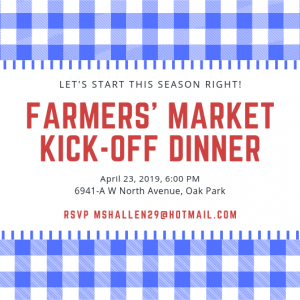 If you are an FM volunteer, or would like to be, please join us for our Farmers' Market kickoff dinner on Tuesday, April 23 at 6:00 PM. We can use all the help we can get! RSVP to mshallen29@hotmail.com so we can order plenty of food.